I stumbled on this Thursty Thursday (ps, spelling it that way is really what sealed the deal for me...) linkup a couple of weeks ago when Lauren was co-hosting + I have been saving this post for the Thursday before Valentine's Day ever since. 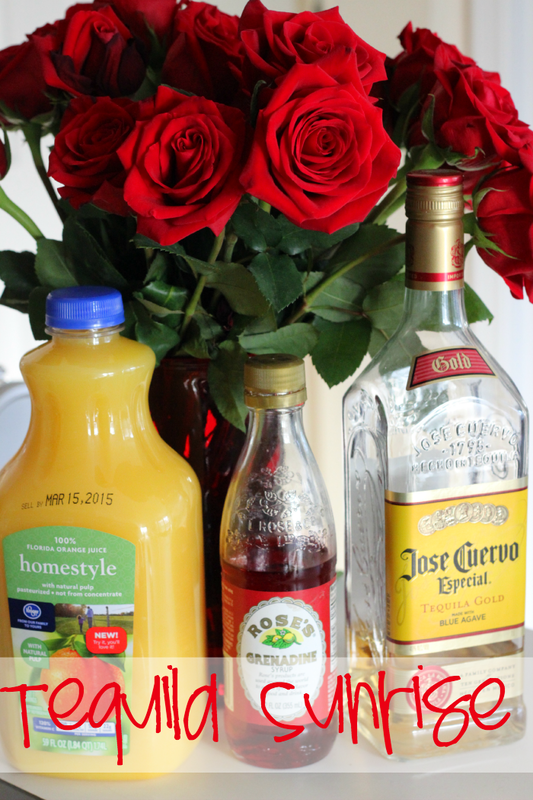 OBVIOUSLY I plan on spending some quality time with my Valentine, Mr. Cuervo, so I thought I'd share the best way to make a Tequila Sunrise. From the expert due to the sheer volume of sunrises I drink. bonus :: cherries or fruit of some kind because yum. NOW. This is very important. I like to do ice, tequila, then orange juice -- that way I don't really have to stir it. I'm pretty lazy when it comes to mixing drinks. Make it as strong or as orange juice-y as you like. I'd recommend the normal ratio -- like a three second pour to each glass. Once you have the orange juice + tequila ratio to your liking add just a splash of grenadine. JUST. A. SPLASH. That stuff is like, 4565% sugar okay? Orange juice is already kind of sweet + tart, so that's more sugar. If put too much grenadine it's gonna make your teeth hurt. Stir + enjoy!! GUYS. I made that. HOW. COOL? Also, it's a fact that we don't have any cups in our apartment that didn't either come from pint night, a brewery, or my sticky fingers. So none of them match. Which makes them all match right? What are you drinking tonight?